Last year I decided to try making dill pickles from scratch. I solicited recipes from friends and narrowed it down to two. Being the overachiever that I am, I made a batch of each recipe at the same time. The methods and end results weren’t terribly different, but I found that I preferred the flavor and crunch of this one to the other. So without further ado…here is my version the recipe, scaled down a bit for a smaller batch. Feel free to adjust quantities. 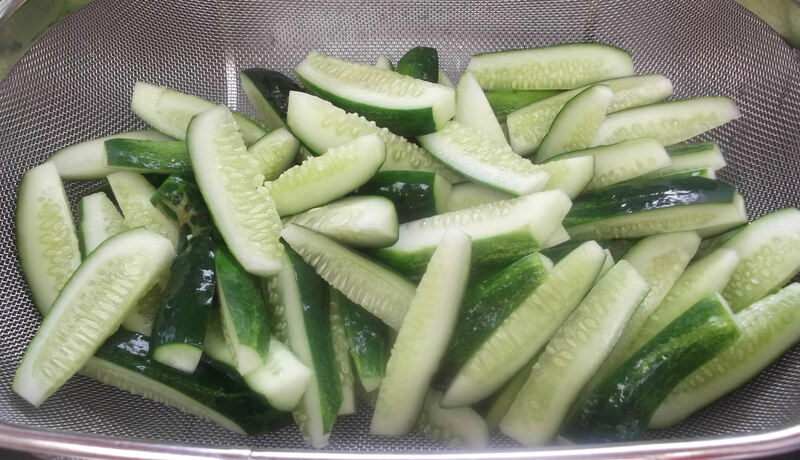 Wash the cucumbers thoroughly and cut them into spears. Place the spears in a large container and cover with water. Refrigerate for at least two hours, but no longer than four. Boil canning jars and lids in a large pot for 10 minutes to sterilize. Place the jars on a cookie sheet covered with a thin dish towel. Leave the lids in hot water. Put three sprigs of dill and two garlic clove halves in the bottom of each jar. 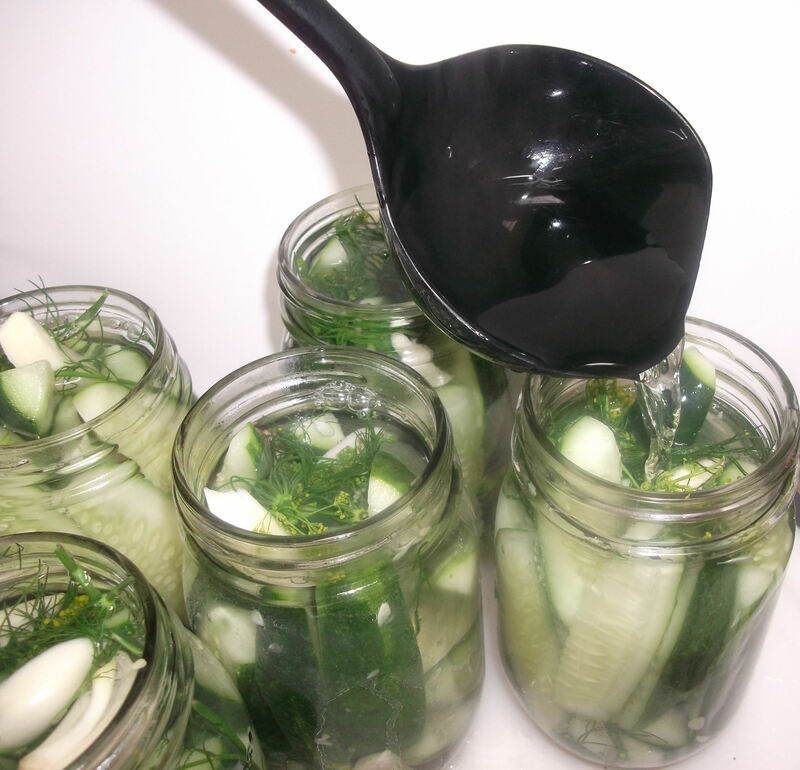 Pack each jar tightly with cucumbers. Place sprigs of dill and two more halves of garlic on top of the cucumbers. Combine the water, vinegar and salt in an enamel pot and bring the mixture to a boil. Ladle the boiling brine into each jar, leaving about ¼ inch at the top of each jar. Gently jiggle and tap each jar to release any air bubbles. Wash the cucumbers thoroughly and cut them into spears. Place the spears in a large container and cover with water. Refrigerate for at least two hours, but no longer than four. 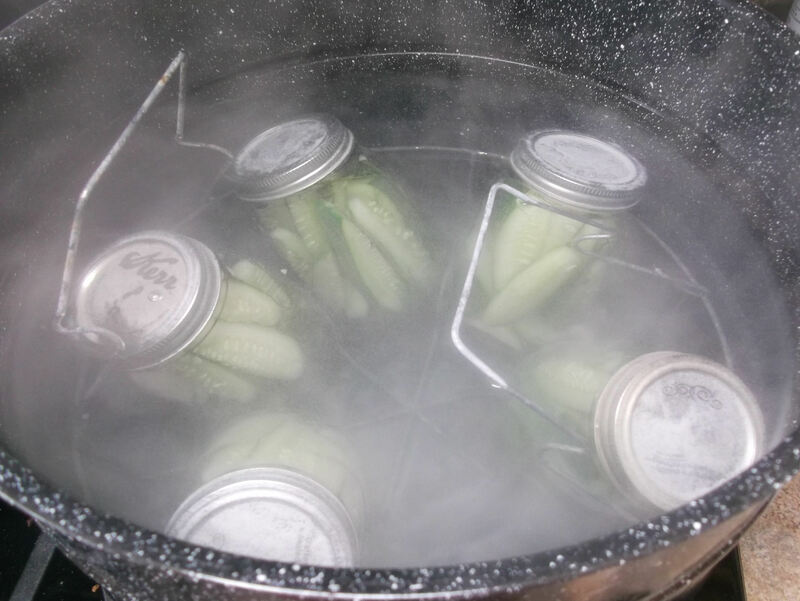 While the cucumbers are chilling, boil the canning jars and lids in a large pot for 10 minutes to sterilize. Place the jars on a cookie sheet covered with a thin dish towel. Leave the lids in hot water. 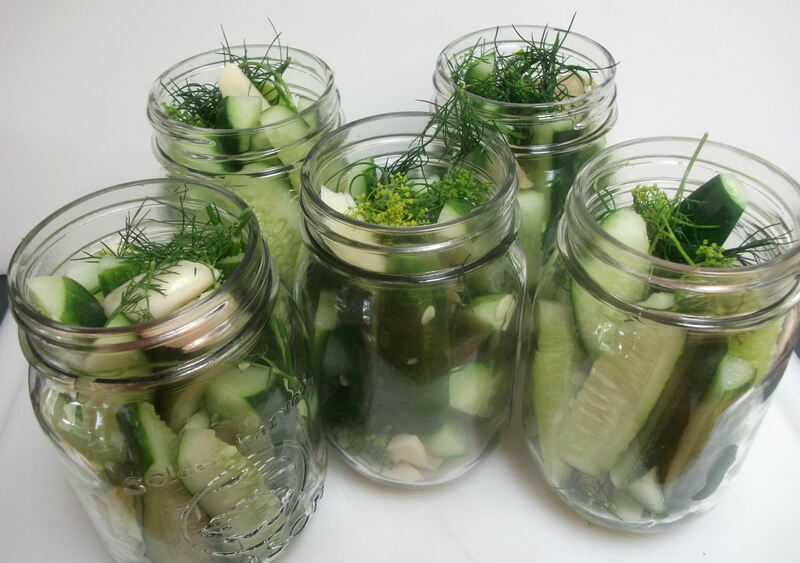 Put three sprigs of dill and two garlic clove halves in the bottom of each jar, and then pack each jar tightly with cucumbers. Place two more sprigs of dill and two more halves of garlic on top of the cucumbers. Combine the water, vinegar and salt in an enamel pot and bring the mixture to a boil. Ladle the boiling brine into each jar, leaving about ¼ inch at the top of each jar. Gently jiggle and tap each jar to release any air bubbles., then wipe the top rim of each jar with a clean damp cloth. Gently screw on the lids and place the jars into boiling water: the water should cover more than half of the jar (I submerged mine completely). Boil for 10 minutes. Remove the jars from water and leave them undisturbed for 24 hours. Check to make sure jars are sealed properly and store for up to two years. Optional: find a friend to design custom labels for you. While the pickles can be eaten after a couple weeks, they will taste best after about eight weeks. 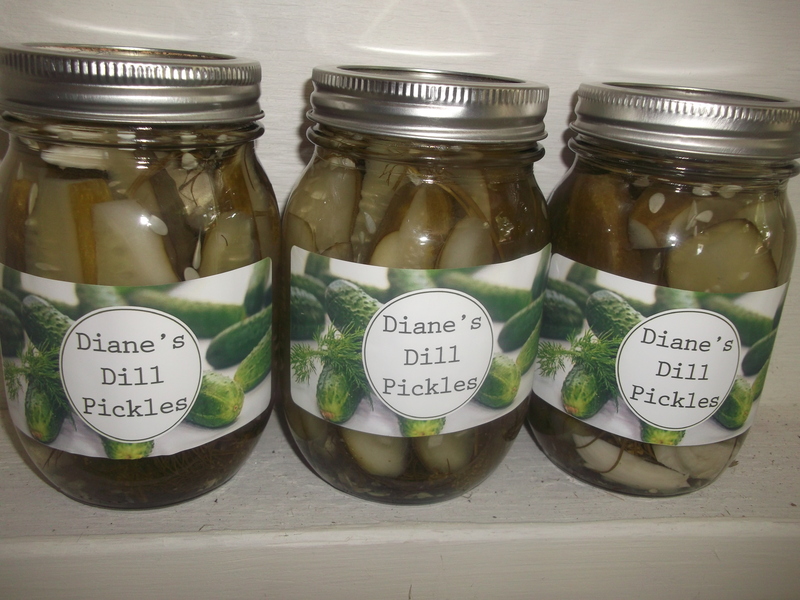 The pickles can be stored at room temperature until opened, but keep them refrigerated after opening. Enjoy!